I strongly object to the installation of surveillance cameras along the beachfront. With that said, I think the arguments by the OB Rag and others opposed to it are a bit misguided. Appealing for liberty to sheep … you may as well try and teach a dog how to fly. In order to win over anyone on this, you have to consider their perspective. It appears to me that a majority of OBcians currently support the cameras in the name of safety. Your newsletter poll said otherwise, but perhaps because they are birds of a feather, to an extent. Police do not care about the privacy of anyone else. If they had it their way, privacy would not exist because it is an inconvenience to them in their performance of duties. It prevents them from trespassing/searching whenever they have a hunch. Not surprisingly they themselves can’t stand being recorded. Therefore the only way they’d change their mind is if it became bad press for them. So our appeal is really to the other citizens of OB. 1. What other use of the funds for public safety was considered? Where any? The citizens have a right to know if there are other ways to spend it short of surveilling them. 2. What will the annual costs be after the initial contract expires? Could that money be better spent elsewhere? 3. What measure will be used to determine whether the cameras are effective before continuing their use? Will the citizens be invited to this decision making process, or will they have to just take the SDPDs word for it? If they prove to be not effective, will they be physically removed? 4. Why OB? Why not all of Gaslamp or East Village for this experiment? Is OB really they poster-child for crime in San Diego? Is there any data to support them being installed in OB vs other areas? This degree of surveillance does not exist elsewhere in SD (outside of balboa park) to my knowledge. 5. Whats to stop SDPD from offsetting any gains by moving resources or officers to other areas, if there are improvements in public safety? Or can we expect it to free up our officers to patrol more in other areas of OB, like the cliffs and alleys? 6. What access will the citizens have to the camera footage? Will it be concealed like police body cameras and only released as they see fit? Will I be able to obtain access of a recording of me if I am a victim of a crime, or if am wrongfully accused of one? 7. OBMA supports the cameras, crime is bad for business. OB merchants already have the ability to record on their own property. Why is this not sufficient? If it is in part due to inadequate police response or officers, then what good is it to add even more cameras? Based on my litter cleanup walks, these trouble-makers at the beach/wall/cliffs are consuming alcohol they purchased at the same local businesses. 8. “It’s a public place, you have no expectation of privacy”. So would you find it acceptable for me to record you while in public? While you play with your children, while you have a romantic moment with your significant other, while you eat a sandwich? Or would you tell me to turn it off and get lost? Personally, I DO have an expectation to not be constantly recorded by police or anyone while in public. 9. “The 4th amendment allows it” – The 4th amendment has evolved over the years but is a poor standard when it comes to privacy of citizens. The 4th amendment currently or has previously allowed wiretapping, bugging of phone booths, thermal imaging of residences, recording of and on private property without consent, cell phone searches, stop and frisk… etc. 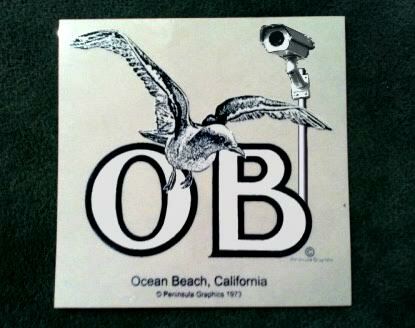 And lastly, I attached revised new OB seagull logo for all those who just can’t get enough of feeling safe. In fact if you find yourself needing any photoshop for a good cause, let me know. Sometimes a picture is worth a thousand words. I moved to OB only 2 years ago to settle down and raise a family, in large part due to it’s unique reputation as a freedom-loving and expressive community. I sure hope those days aren’t already over. Because so many people are ruminating on this issue, I just might show up at the big meet on Wednesday. I’ll be in a thong. Frank must be very overworked because of all the errors in this post. If I may . . .
“Not surprisingly they themselves can’t stand being recorded.” Very good use of the reflexive pronoun! “Here are my arguments:” Subject & verb must agree in number. #4 Is OB really their poster-child . . . (outside of Balboa Park) Proper nouns need caps. #5 What’s. A contraction needs that lil apostrophe. #7 “OBMA supports the cameras; crime is bad for business.” The semi-colon brings it around from the comma splice error. Kevin, if I may, this was a “reader rant” and I believe editordude didn’t wish to edit something like this, plus there was a deadline issue, as I understand. The post was not mine. Are you gonna let him get you? Sigh..Your personal feelings about being recorded are moot..the legal standard is you have ZERO expectation of privacy in public ……feelings are moot. That said…..I oppose the cameras as unnecessary. I really don’t think this is legally or constitutionally absolutely true. A little looking around on the Interwebs reveals sophisticated legal/constitutional discussions that quickly show the issue is in play and has always been in play, in a multitude of ways. Craig is correct, it is 100% legal according to the supreme court, they could go even further and film the front of your house if they wanted to. Now you may disagree with the supreme court on the constitution. I think it fails the “Katz v U.S.” test when they turn on the night vision feature, but precedent has said its legal. But nobody here is fighting the supreme court, we’re fighting the local government. Just because it’s legal doesn’t make it right. Point taken, but there are many qualified observers who say that constitutional objections to government video surveillance in public spaces remain absolutely relevant. For example, the folks of the Constitution Project have described this jurisprudence as “permissive,” and do not agree that this permissive jurisprudence establishes legal and constitutional acceptance of such surveillance in perpetuity. And, to your last point, I agree, we all understand the legal interpretation of contemporary issues relative to the Constitution as an ongoing process. From the Constitution Project’s 2007 “Guidelines for Public Video Surveillance”, it’s clear to me their discussion of jurisprudence quickly reveals lots of grey area and wiggle room to push back against government overreach of indiscriminate blanketing of public spaces with video surveillance. The case against can be made.